Do your kids get along? Some sibling fighting is normal and even healthy. Kids have different personalities, tastes, perceptions, likes, and dislikes and individuality must be allowed if we want authentic connections to form. However, we tend to base our value or competence as a parent on how well our kids get along or how much conflict we experience in the family. When our kids fight - we feel stressed and blame ourselves. The sabotaging thoughts, "I'm not good enough," or "This isn't working," capture our rational mind, and elicit a powerful urge to control our kids. When the alarm center signals the brain that there is danger, we shut down connections to empathy and thoughtfulness, and instead of making choices that inspire our kids to learn more about themselves and others, we revert to dominating the situation and directing the outcome with punitive, threatening, or uncompromising attitudes. This "discipline" denies siblings an outlet to channel those unhappy emotions and find strategies to work out their differences. When we control the situation or direct the outcome, one child often comes out feeling like the "winner," and the other one buries his feelings deep inside. However, when our kids play "nicely," we feel worthy and capable. This is an emotional game you don't want to play with yourself. Conflict is not the enemy. What matters is whether we see conflict and disagreement between our kids as dangerous or developmental. When we view sibling conflict through a developmental lens, we respond with patience and guidance because we know children are still learning how to manage problems on their own. Many times, kids will work it out. If they are provided with good models and time to develop, they'll get better at communication and problem-solving as they mature. At other times, you'll need to step in and restore the calm, help your kids regulate, create space for them to have a voice, and give them a chance to practice their skills alongside your nurturing responses. Once children learn to express what they need and how they feel clearly, they will be able to afford others the same opportunity. In this TEACHable Moments episode, I'm sharing a few strategies which will help you help your kids get along. Sibling fights were an everyday occurrence growing up in my house. I remember feeling a lot of resentment and anger fueled by the injustice I felt at being the "oldest" and therefore responsible for the poor behavior of my younger siblings. When there were disagreements, verdicts of guilt and innocence were issued unsympathetically, and conflict was typically handled with swift, punitive actions and mandatory groundings. I was usually found responsible for instigating trouble (or not stopping it) and pressured to change my behavior because I was "older" and "should know better." My feelings of isolation and shame grew, but my behavior rarely improved for more than a short time. When you're controlled, you learn to use force. When my siblings didn't "listen" to me, I felt unable to contain my anger, and they became the target of my aggression. I was unable to stop this pattern or explain it. I lacked the skills I needed to self-regulate and didn't feel I had an understanding, caring adult on whom I could rely to help me expand my self-awareness and develop those skills. I needed a calm, composed, empathetic adult willing to listen - to hear me out and understand my point of view. I felt misunderstood and unloved. "Never able to do anything right," became part of the internal dialogue which shaped my identity and self-worth. So, whether it is an older sibling who has stuffed down anger and jealousy targeting a younger child or a feisty younger child who pushes a more passive, older sibling to the brink - aim to look under the hood and connect before you direct. ASK: What is underneath these antagonistic behaviors which are driving a wedge between my kids? 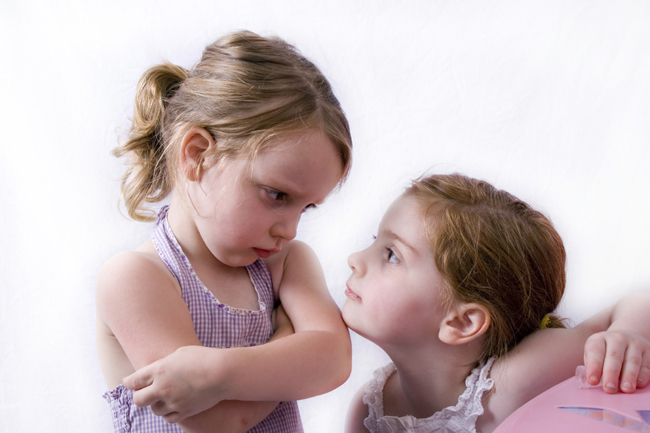 Look for the root causes of negative sibling dynamics, and then seek out and appreciate your child's point of view. Let go of the fantasy your kids will never fight or that they will be the best of friends, and instead, equip them with the skills they need to respect others, expand their tolerance, and peacefully manage disagreements. After you watch the video, try this exercise. I shared a few language re-frames in the video - but it would be great if you would share your example and post it below for others to learn from! Can you put the feelings into words? What is ONE complaint you hear from your children most often? Let's reframe it without judgment and then leave your example in the comments below. Thank you so much for watching, reading and sharing and please remember, it's about being conscious - not perfect!